Artissima and the Fondazione Nicola Trussardi are presenting Alighiero & Boetti Day, a twelve-hour, non-stop event, curated by Luca Cerizza, Massimiliano Gioni and Francesco Manacorda, which will explore the complex, multifaceted figure of Alighiero Boetti. 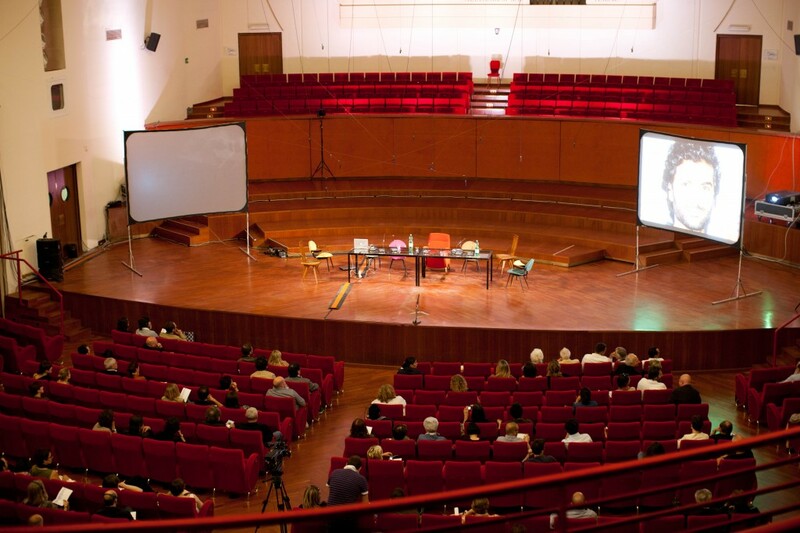 From noon to midnight on Saturday, 28 May 2011, in the evocative setting of the Auditorium RAI in Turin—designed by Carlo Mollino in 1952—artists, art historians, critics, writers, musicians, scientists, and collaborators and friends of Alighiero Boetti have been invited to come together and investigate the wide-ranging, influential work and ideas of one of the 20th century’s most significant, yet most enigmatic artists. Salman Alì, Stefano Arienti, Stefano Bartezzaghi, Thomas Bayrle, Achille Bonito Oliva, Robert Cailliau, Clino Castelli, Maurizio Cattelan, Germano Celant, Laura Cherubini, Francesco Clemente, Lynne Cooke, Pino Corrias, Roberto Cuoghi, Mariangelica De Gaetano, Mario Dellavedova, Pietro Derossi, Dexter Sinister, Patrizio Di Massimo, Peppe Frana, Guido Fuga, Giorgio Galli, Mario Garcia Torres, Piero Gilardi, Mark Godfrey, Emidio Greco, Rolf Lauter, Corrado Levi, Giorgio Maffei, Randi Malkin Steinberger, Andrea Marescalchi, Massimo Mininni, Jonathan Monk, Hans Ulrich Obrist, Luigi Ontani, Giulio Paolini, Francesca Pasini, Michelangelo Pistoletto, Paola Pivi, Christian Rattemeyer, Maria Teresa Roberto, Pier Luigi Sacco, Daud Khan Sadozai, Salvo, Federico Tiezzi, Tommaso Trini, Andrea Valle, [iaŋ] [voo], Adelina von Fuerstenberg and Lawrence Weiner are just a few of the names who have enthusiastically signed onto the project, and who will be paying tribute to the figure of Alighiero Boetti in many different ways. Through the stories they can contribute—as extraordinary travelling companions, or simply as artists, thinkers and critics who look back on Boetti’s work with fascination—Alighiero & Boetti Day will offer a fresh interpretation of Boetti’s pivotal role in Italian culture and the international art scene. Alighiero & Boetti Day is a one-of-a-kind, hybrid event, a cross between a conference, artistic project, performance and biographical narration: twelve hours of sessions, open to the public, which will include individual speakers, discussions, roundtables, screenings of films and interviews, presentations of never-before-seen material, readings, artistic incursions and theatrical gestures, fitting together like a thousand tiles to compose a single, vast, colourful mosaic. An invaluable opportunity to learn more about the artist, Alighiero & Boetti Day is also, above all, a way to look back over Alighiero Boetti’s artistic practice through the eyes of those who were close to him and still are: the experts and artists of different generations who continue to keep his legacy and thoughts alive. Alighiero & Boetti Day experiments with a new exhibition and research format: a platform of exchange centred not on works but on stories and first-hand accounts, aimed at celebrating an individual who achieved legendary status for many artists and cultural figures in the past, and who seems even more significant today. With Alighiero & Boetti Day, Artissima and the Fondazione Nicola Trussardi are dedicating an impassioned tribute of international resonance to Alighiero Boetti in his native city, Turin, retracing the many facets of the artist’s insightful work, and affirming his central role as one of most influential figures in the history of contemporary art. Alighiero & Boetti Day is a project curated by Luca Cerizza, author of Le mappe di Alighiero e Boetti (Electa); Massimiliano Gioni, artistic director of the Fondazione Nicola Trussardi; and Francesco Manacorda, director of Artissima. The event is co-produced by Artissima and the Fondazione Nicola Trussardi as part of Giorno per Giorno 2011, an initiative sponsored by the Fondazione per l’Arte Moderna e Contemporanea CRT, Turin.